After year of qualifying and anticipation my first Paris-Brest-Paris was before me. Arriving from a Wellington winter, that is now known as snowmageddeon, the 30+ celsius days in Paris and an epic electrical storm were making me incredibly nervous. Start day, Sunday was a another steaming hot day. The evening start hid the heat of the day from me. The temperature was more mild once riding away from Paris, so the nerves were entirely unfounded. After riding 1230km in 85 hours and 32 minutes it is hard to concisely gather my thoughts on this amazing event. So, if you would like to more about this ride (and why you should ride it) please do not hesitate to ask. I could ramble on for hours about the PBP :). Since returning I have been feeling a bit of what next. 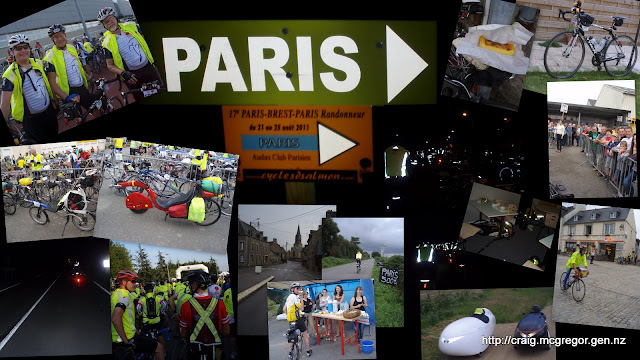 The feeling of a need to do something else even more epic is directing my mind to investigate some of the other great adventures that our fine planet offers – after all the next Paris-Brest-Paris is not until 2015. Yes, I enjoyed it so much that I intend returning to ride it again. How could I enjoy riding 1200km in 3-and-a-half days so much? It is the United Nations of cycling (without the politics): Over 5000 riders from over 60 countries. All riding with one goal – completing the course in under 90 hours (or 84 or 80). Some would ride fast and sleep lots; others ride slower and sleep less; yet others would try and eat at every restaurant along the route and still finish in the allotted time. There were others racing it too. Naturally, I never really saw them. I have never ridden in a peloton with so many languages spoken. I may not have understood a word, but I enjoyed the experience all the same. Support on the route: While there is excellent support at the controls, and in officials organised by the Audax Club Parisien, it is well backed up by support of locals when riding through towns with the locals yelling “Allez, allez” and up hills “bravo, bravo”. This is surely the closest I will ever get to feeling like I am riding in the pro-peloton. On top of that many locals stay up all night providing coffee, crepes and cakes for passing cyclists – usually for the promise of a postcard. This all adds to the atmosphere that makes the Paris-Brest-Paris a ride like no other. History: How many other events or activities can you participate in that date back to 1891? Or, as a cyclist back to the beginning of the “modern safety bicycle” and pneumatic tyres. Ride–Eat–Ride: I’m not sure if there is a better way to live? Good food all the way at the controls, patisseries (some stay open all night for the PBP), restaurants and locals providing coffee, crepes and cakes. Sense of achievement:The PBP is one of the thousands of sporting activities that are more than achievable, even for non-athletes. Whether by talent, or determination 1200km in 90 hours is achievable but is also a challenge and not a cakewalk. While after finishing, you just feel like sleeping, the realisation that a long held goal, and not an easy one has been accomplished. Even my cycling mates think I’m crazy now, but the thrill I find in the seeking the extent of my limits through challenges that are further, faster, harder and more epic than before is what actually keeps me sane.